But WHY so? In the recent decades, most of the population in our country has become more vigilant about health and the factors impacting the sleep quality. Most consumers seek the safest and natural option on the market to safeguard their own and the family’s overall well-being. Thus, every year, mattress manufacturers innovate the trending designs to suit the changing sleep preferences. To meet the consumer needs, mattress brands are also applying these technological modifications to latex beds. The advent of latex sleep surfaces on the market was widely welcomed across the world! Combining a plethora of beneficial qualities, such as lack of harmful adhesives, volatile compounds, allergens (isocyanates), toxic flame retardants, and polyesters attracted health conscious folks. As a result, in recent years, this category became one of the most in-demand sleep surfaces in the country, with a consumer satisfaction ratio of 80% for latex beds, which is pretty impressive! One would think though - why are people so overly fussy about this mattress category anyway? Let’s find out! What is so Special about Latex? 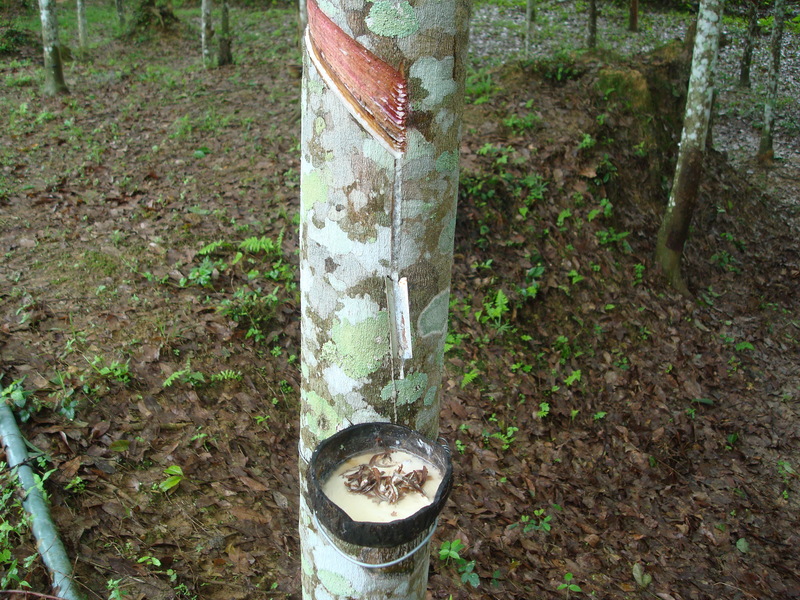 Extracting White Sap from Rubber Tree Latex is extracted in the form of rubber, from a plant called Hevea brasiliensis. The latex mattresses are among the high-end models due to their unique construction and beneficial properties. People usually find it soft in feel, compared to the slightly firmer innerspring beds. Additionally, these beds are known to be quite long-lasting and can endure weight for years. So naturally, you get excellent value for the big bucks you spend on them! Breathability is yet another factor why most people have started choosing latex over other categories. The traditional memory foam and spring certainly do not match that remarkable airflow level. Learn more about foam vs spring. And as a cherry on top, latex is, in essence, a natural material. The organic beds hardly contain any synthetic blends and are created using chemical-free procedures. Hence, a lot of parents have started opting for latex surfaces for their little ones. Similarly, people with dust allergies, looking for a hypoallergenic and antimicrobial sleep surface, also go for this type. Latex is free of dust mites and mildew, as the creepy crawlies and allergy-triggering agents tend to stay away from natural products. Because of these fantastic characteristics, the national latex mattress market is consistently flourishing. Mattress manufacturers are discovering new ways to make latex beds healthier and comfier than ever. However, the hassle of selecting the perfect latex mattress is a bit complicated. For example, while going through the current models on the market, you’ll come across the words Dunlop and Talalay. Yeah, fancy science-y words. If you’ve no idea about what they mean, the whole “buying the best mattress” process might get super overwhelming. And, trust us, you don’t need that kind of stress in your life! Therefore, to make the mattress purchasing procedure easier for you, in this blog, we’ll explore the Dunlop vs Talalay battle in detail. We’re going to explain the unique features of each and expound the reasons why these considerations are necessary during mattress selection. Wait up! Interested in buying an online mattress? Here’s what you need to know! Even though in essence both Dunlop and Talalay beds are made of the same material, their properties differ significantly. The mere change in the processing technique gives each of these beds a plethora of unique features. The main distinction among various latex beds primarily lies in the manufacturing process and the steps involved in yielding the final product. Dunlop and Talalay are basically two different processes forming the foundations of mattress production in this category. Some consumers end up buying the wrong latex bed. This happens when the processing technique is neglected while purchasing a new mattress. Hence, it is crucial to consider whether your latex bed is a Dunlop or Talalay model. This will eventually help you better understand what to expect from your new sleep surface. Due to this reason, all latex sleep surfaces have marked variations in terms of comfort, support, pricing, durability and various other features. And that’s why, it is vital to consider whether the latex mattress you’re buying is Dunlop or Talalay processed, because both are quite unique in feel. Read on to find out how each of them are processed and why they possess varying properties. The raw whipped mixture is poured into the mold in one go and filled to the top. Mixture is steam baked, washed and finally dried to obtain the common form of latex bedding, Dunlop. The result This method yields a foam that is denser at the bottom as compared to the top. Why? The answer is gravity. The latex cells are pulled to the bottom inside the mold, and the lower layer is densified. Internally, the Dunlop foam is comprised of a unique open-cell structure that gives high tensile strength and durability to the mattress. For making Talalay, the raw mixture is added to fill half of the mold and then a vacuum is applied to extract the air. It is then frozen at -28°C and further exposed to high heat, antioxidant and sulfur to obtain the required structural vigor. In the final step, the product is extensively washed and subjected to drying for strengthening the foam and removing harmful residues. The result This process leads to the formation of a more uniformly dense foam that has a consistent cell structure. The flash freezing and exposure to alkaline environment leads to the gelling of latex molecules in a definite symmetric structure. Additionally, the process ensures the latex cells maintain their natural circular shape, creating a consistent structure from top to bottom. Talalay Mattress Now let’s check out the in-depth features and characteristics of Dunlop vs. Talalay individually. The differences in the manufacturing processes of Dunlop and Talalay primarily affects the density of the mattress. The density of a mattress is defined by its weight—the heavier the mattress, the denser it is. If you are familiar with terms like compactness or firmness of a mattress, then density is just another synonym for them! The overall comfort, durability, and support of the mattress are determined primarily by its density—which makes it pretty significant. Dense mattresses are generally more suitable for heavy people. Other factors, for instance, your sleep position, durability preference, and budget, affect your decision while going for a denser mattress. The one-go pouring and baking process of Dunlop yields a denser foam. It has a firm surface—firmness of a mattress is directly proportional to the density. However, the density of Dunlop is uneven, being more at the bottom and less on the upper side. Talalay latex is less dense than Dunlop. It has a myriad of air bubbles which makes it extraordinarily soft and lightweight. So, if you are looking for a denser mattress, then you should go with Dunlop. The durability of a mattress is its lifespan. Latex foam provides a quality that lasts longer! Dunlop has a dense internal structure which makes it firm and durable sleep surface. The hard surface has the ability to withstand pressure and the strong cell structure do not allow indentations or sagging of mattress. However, Talalay mattresses have an organized cell structure which causes an equal distribution of weight and stress. The intense and repetitive heat treatment (vulcanization) of latex cells makes them acquire a perfectly round shape that can endure pressure and weight with perfection. These flash-freeze cells are not de-shaped for a very long time. This makes Talalay mattress practically sagging-resistant. However, the life or durability of a mattress primarily depends on how you treat your mattress. Various factors, such as lack of mattress rotation, flipping and switching sides, can lead to early sagging of a mattress. The latex mattress does not give you the trampoline bounce of a spring mattress. But due to a certain level of resilience—also called mattress elasticity—provided by the latex foam, Dunlop and Talalay, do offer you a choice. Mostly, the elasticity of a foam is measured by a simple “ball rebound” test. A ball of steel is dropped onto the mattress from a certain height and rebound of the ball is noted in terms of percentage compared with the predetermined height. Generally, the latex mattresses have a resilience of 60% to 70%, and elasticity of regular polyurethane foam is around 50%. So, if you are looking for a bouncy latex mattress, you should have these figures in mind! When it comes to resilience in Dunlop vs. Talalay, the higher density of Dunlop makes it less bouncy. The firm surface withstands your weight and you get a supportive feel, rather than a bounce. The immense softness of Talalay sleep surface offers you the bounce without the springs. That is why, if you need a bouncy feel in your bed then you need to go for a Talalay mattress. The freedom offered by a mattress basically means how easily you can move and change positions on it! Gladly, the firm surface and high resilience of a Dunlop mattress are quite efficient in doing so. People who sleep in different positions definitely need this kind of freedom in their lives. So they can easily change their posture at night and not feel stuck in the foam. Dunlop provides a firm sleep surface that is ideal for you if you are a hard-bed lover. It provides the freedom to move and change positions. Also, if you are the one who dines, works and write in the bed, then Dunlop mattress should definitely be your choice. Don't worry about spills on the firm surface of Dunlop! The process of making latex mattresses is environmentally friendly as it preserves the plantations. The milky sap—used for making latex—is extracted from the tree in a harmless fashion and there is no need to harvest the trees. Such a relief! Latex mattress doesn't off gas! Unlike conventional petroleum-based foams, latex mattress does not release volatile organic compounds (VOCs) and are free from harmful chemicals and flame retardant polymers. VOCs have been reported to be linked with headaches, irritation of eye, nose, and throat and various types of cancers. The conventional mattress have flame retardant chemicals that tend to bioaccumulate in the body and lead to endocrine disruption, infertility, and cancer. Thankfully they are not present in the latex foams! Latex mattresses are also odor free, some might give the new smell, but it goes away without much effort. Another aspect—carbon footprint— significantly defines environmental friendliness of a product. The complex process and added manufacturing steps of the Talalay process generates more carbon footprints (the number of harmful byproducts produced during the manufacture) as compared to Dunlop. If you are that person who eats organic and prefer walking to work—to control the CO2 you are adding to the environment—then Talalay is not for you. Conversely, Dunlop latex is manufactured through straightforward and environment-friendly process and keeps your carbon footprints under check. Nature should be loved . Both Dunlop and Talalay natural mattresses have various third-party certifications for their quality and safety. These include GreenGaurd, OTCO-Certified Cotton, CU/GOLS- Certified Latex. However, the extensive washing steps present in Talalay mattresses make it free from all kinds of allergens, chemicals, mites and bacteria. It holds the Oeko-Tex Standard 100 rated that guarantees its health and safety. This makes Talalay the finest and baby safe mattress. So, if you buying mattress for kids or loved ones, you would definitely want to check some certifications first! Baby Soft Belly Time Which one should you take home? If you are.. The firm, supportive surface of Dunlop is probably where your search for “mattress for heavy people” comes to an end. Dunlop has a firm structure, it can withstand the weight, and also reduce your chances of sinking into the mattress. The high density of Dunlop and firm surface makes it the perfect option for bulky people. It will be a comfortable and durable choice! The Talalay latex mattress is flexible and soft and its internal structure allows an even and decent distribution of your body weight. So, basically, in this aspect, every person is unique according to their weight and weight distribution (upper body or lower body obese). Gladly, our showroom, SleePare Showroom NYC, offers a trail service to our customers, where you can lay down on the mattress and select what’s perfect for you. The idea of sleep-test a mattress before bringing it home is trending. It gives you the power of survey so that you can bring the exact feel you like about any mattress in a showroom, home. Calm or Combination sleeper ? If you are a restless or a combination sleeper, then the flexible structure of Talalay will work wonders for you. It has a very welcoming feel and can instantly contour and cushions the shape of your body. Conversely, if you are a strict belly sleeper, then you should consider the firm, supportive surface of Dunlop. Dunlop provides support to your back and helps to maintain the spinal alignment. Medically, sleeping on your stomach is bad for your spine and neck as most foams and mattresses fail to support the alignment and joints of your body. While, Talalay does not provide support to the spine as it is soft and offers less resilience. That is why it is not a good choice for stomach sleepers and it can cause damaging effects on your head and spine. Dunlop proves to be the medium-support mattress that is medically recommended for belly sleepers to reduce stress on their back and joints. However, if you are a side sleeper, Talalay is the better choice as it contours and adjusts according to your body curves. It helps in pressure-relief as you sink in to the softness of your foam. Dunlop is not the perfect choice for side sleepers as it does not provide the required contouring of the pressure points—hips and shoulders. Its firm surface induce stress on these body parts as the spine is not aligned in a comfortable posture. Latex foam can also help to combat various sleep disorders. Latex bedding has been used to investigate how it affects various sleep parameters, including sleep onset (the time you need to fall asleep), sleep maintenance (deep sleep), sleep quality and sleep motor activity. In a study carried out in 2011, it was reported that the introduction of a new latex mattress significantly improved sleeping patterns of 16 healthy individuals. And a good night’s sleep can improve your motor skill learning and cognitive abilities. So, it is necessary you select the right mattress that aids you get a sound sleep and your body gets the time to heal and rejuvenate. Like so many people, if you experience night chills, nightmares that make you sweaty, it is better you treat yourself with a Talalay mattress. Its internal cell structure is highly organized (tube-like) allows efficient flow and dissipation of heat from the bed. Talalay foam maintains a pleasant sleeping temperature and does not allow your bed to get too hot! Dunlop has a dense structure, that leads to decreased chances of heat distribution and an increased heat retention. This can be problematic for the sleepers in many situations, especially night sweats. Have back pain or a Bad Posture? If you are looking for a new mattress due to back pain, bad arthritis or poor body posture, it is advisable to go for a mattress with a medium firmness. Supportive mattresses are becoming popular and are recommended for various medical purposes. Latex sleep surfaces provide excellent support to your spine. Cure your Back Pain by selecting the right mattress People with stiff and painful joints require a latex mattress that helps in pressure relief and in that case, the soft-flexible feel of Talalay mattress should do the trick! And for people with back and neck pain and are looking for a firm, yet comfortable foam options, the Dunlop mattress is what they should try. A trial study in 2003 was carried out to analyze the effect of mattress firmness on chronic back pain. It showed that people who suffered from various types of back pain and body postures problems benefited from the use of a moderately firm mattress. So, if you are looking for the best mattress for back pain, Dunlop sleep surface can be your choice for comfort and remedy. As Talalay latex mattresses have a plush in soft feel, they are not very supportive. If you don't have back pain, then you can suffer from mattress-back syndrome or other health issues by sleeping on the wrong mattress. In Fact, in some cases, mattress with poor comfort and flexibility proves be the culprit of chronic back pain. Various studies support the idea that sleeping on the wrong foam can trigger back pain. So, choosing the right mattress (prevention) is better than cure! If you are a couple looking for a perfect mattress, then a foam with impeccable comfort and elasticity should be your choice. Talalay is considered the best choice for couples, especially when it comes to giving space to each other. The organized internal structure of Talalay offers the required elasticity to prevent partner disturbance, But if you have kids who love jumping on the bed— and obviously you don’t—it's better you buy Dunlop for them and test their determination! Dunlop latex foam has less elasticity and cannot be used as a trampoline by kids. The Latex Pillow: Why not get that luxury of latex under your head too! If you are allergic or have germ phobia or both, Talalay latex pillow is where you want to rest your head. Talalay latex pillows are considered the most breathable, hypoallergenic and are resistant to the growth of various molds, mildew, and mites. They are excellent in providing support and comfort and maintain the perfect body posture and sleeping temperature. Latex Pillow for comfortable sleep Look out for Latex Allergies If you have never used a latex foam before or are allergic to tomatoes, chestnuts, kiwi or banana, then you should get yourself checked for latex mattress allergies! Latex Allergy Reaction Certain latex proteins can trigger allergic reactions in people, which differ in severity among different individuals. Various studies have reported the presence of allergenic proteins in various latex containing items, including latex gloves, elastic bandage, household rubber gloves, and mattress. The presence of physical barriers including sheet, mattress covers and pillows somewhat reduce the direct contact of skin with the latex foam. But the risk of triggering a severe allergic reaction is worth considering before buying a latex mattress. Take away words.. So, how do you want to spend the 2400 hours per year of your life —the time you spend in bed in a lifetime! I hope this article would have provided you with helpful insight to get comfort and wellness in your sleep hours, by choosing the right sleep surface for you.